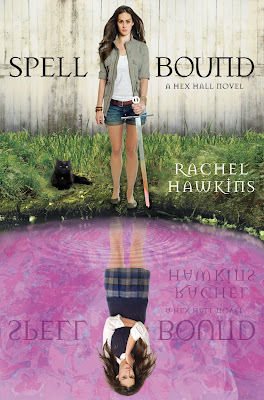 Rachel Hawkins revealed the cover for Spell Bound today, the third book in the Hex Hall series. I've gotta say, I love it! I'm still not a fan of the title, but I can come to terms with that. This cover is gorgeous. I really hope the cat comes into play somehow. I'm sad to see this series come to an end, but I'm definitely anticipating Spell Bound! Demonglass rocked my socks. What do you think of the cover? The colors are way different than what I expected, based on the first two books and they're not exactly my favorite but hopefully the insides will be really good. Hmm, I like the purple pond. Such a great pop of color. It goes so well with the others! Ahhhhhhhhh! I love it!! I love this series sooo much!! I am so happy the cover matches the others! Love the lavender colors going on! I love that now she is warrior girl and boarding school girl is the reflection! The name though is sad to me because it is the third "spell bound/spellbound" name is a years time that I'll be reading! Spellbound by Cara Lynn Shultz, Spell Bound by Kelley Armstrong and now this one....lol. I'll get them all confused!